Today, I suggested we travel up to Holly Hill to check out yet another “can’t miss” BBQ place that has a great reputation in our area – Sweatman’s BBQ in Holly Hill, SC. Sweatman’s has a longstanding tradition for quality BBQ. There have been some complaints I’ve read online about a change in ownership and a change in the”buffet” that is offered. I don’t know anything about this. What I do know is that the “buffet” is not of the all-you-can-eat variety. Personally, I think it is a mistake to call it a buffet because that implies all-you-can-eat, and as a result, the customer comes away disappointed and feeling a bit cheated when he learns that that is not the case. Regardless, that is Sweatman’s approach. With high expectations, we made the trip up to Holly Hill to check out the BBQ. Pulling up, we found a great location for BBQ. The restaurant is an attractive, unpainted, wood-shingled-sided home under a stand of large oak trees that sits back from the road surrounded by fields. It welcomes diners with a pig-shaped Sweatman’s BBQ sign by the gates which surround the entrance. First, the interior is nice, well keep and decorated tastefully with many different rooms for dining. There are two entrances: the front doors are for those who want to sit and enjoy their meal; the right side entrance is for those picking up their orders. After confirming that they accepted credit cards (many BBQ places do not, and I had forgotten to get cash), we placed our order: 1 large plate (“I fix”), 2 regular plates (“they fix”). Cost = $26 While the menu board listed the plates as “you fix” and “we fix”, in our case, each of us fixed our own plates. They did, however, distribute the ribs: one to the regular plate and two for the large plate. 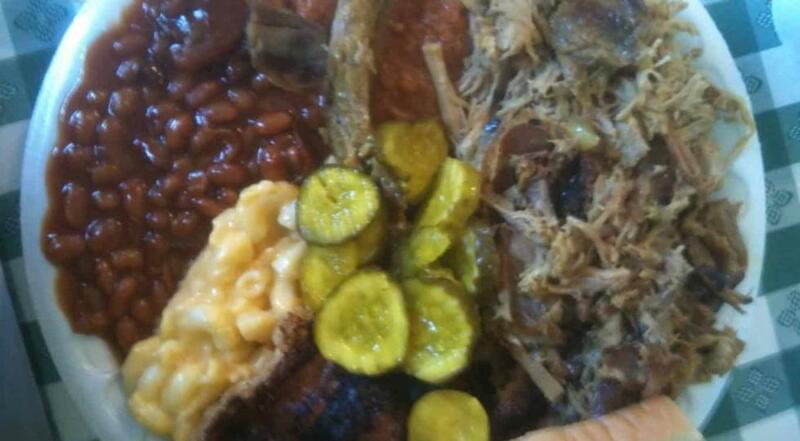 After looking things over, we chose from a nice choice of sides: mac and cheese, green beans, hash and rice, baked beans, pickles, white bread, pork skins, banana pudding, and more. We picked up sweet teas on the way to our table. Note: We were originally charged $36 for the meal. It dawned on me on the way home that that seemed like a lot. Later that week, I contacted Sweatman’s via their comment form on their website and inquired about the charge. Susan Paramore responded promptly and sincerely, regretting the overage. She has since sent me a check for the balance. In every case, our interactions with the folks at Sweatman’s was very positive: from the cashier (who I suspect was Susan) to the lady behind the buffet, to the young lady who helped us to our tables and waited on us. After filling our plates, we sat in a small room with three or four tables and dug into our plates. The BBQ is cooked over wood coals and it is delicious. They do not pre-sauce the BBQ as far as we could tell, so the flavor of the pork itself is easy to find. It has a great natural flavor. They actually separate the BBQ into two trays: one with darker meat and one with lighter. I got both. In short, the meat is very, very good. There were three sauces on the table: one was vinegar-based, another was mustard-based, and the third was… I don’t know… Heather suggested it was a honey mustard that might be good on chicken. We didn’t like it for our pork BBQ. We concluded that the mustard-based had a certain sweetness to it, but I commented that I liked the vinegar better. I actually like mustard-based sauces, but frankly, we haven’t had one that I would want on my BBQ over the vinegar/pepper sauces. Heather seemed to like the mustard ok. It was too overpowering for me, hiding the pork somewhat in its sweetness and tang, but it was a good mustard sauce in general. The ribs, I think, were covered in their mustard sauce. They were cooked well and very tasty. As for the other items on the “buffet,” I will say Sweatman’s without question has the best sides of all the places we’ve eaten so far. “The baked beans are excellent,” I said. Heather followed that “the hash was good, too.” This is, in fact, the only hash that I’ve known Heather to really enjoy. “I actually like this, I can honestly say, better than I’ve ever liked it before,” she said. The hash also had a bit of sweetness and was the best hash I’ve had in a long while. The baked beans were smokey and sweet and creamy — excellent all around. “The mac and cheese is cheesy,” Camden said, and indeed it was very good. It was creamy and quite delicious. Pork skins were better than the skins I had from Scott’s. The bag I got from Scott’s was also “off the hog” (not deep-fried but from the skins on the hogs being cooked over the coals), but were harder to eat and fattier than the light, crunchy skins I had at Sweatman’s. They had other sides as well: green beans which Heather enjoyed, good, store-bought bread and butter pickles, white bread slices, coleslaw and probably more that I don’t remember. After the quality of the BBQ, the real question of the day was the banana pudding. We had read great things about Sweatman’s banana pudding. Because of past experiences, we are always very skeptical of banana puddings. Frankly, most banana puddings are awful and begin with help from Jello brand pudding mixes. I unabashedly assert that Heather makes the single best banana pudding I’ve ever eaten and always will every other pudding be judged against hers. A “real” banana pudding is made with a custard, not with Jello banana-flavored pudding. We won’t deign to scoop out a Jello-based banana pudding. “That’s a good banana pudding,” Heather said, taking her first bite. “It’s made with whipped cream, though.” She pointed out that they mixed whipped cream into the custard-base, which gives it another level of sweetness. This did not, in any way, detract from the quality of the pudding. As Camden said, “It was awesome!” I agreed with them both and will lodge only one complaint: you only get a small cupful! If this were an all-you-can-eat buffet, we would have enjoyed additional servings of the pudding. This, mind you, is high praise from us. Sweatman’s makes great pork BBQ that is worth a visit for the BBQ alone, the sides are equally delicious, and I can personally attest to their ethical business practices. Bottom line: was it worth the trip? Camden answered the question shortly after we sat down and upon leaving we all agreed: a unanimous yes. And if you find yourself on either I-95 among the throngs or speeding your way along I-26, you can easily find your way to Sweatman’s. It is only about 10 miles from exits on either interstate. Use those links to learn more. Since I have moved to Summerville, I don’t eat Sweatman’s bbq like I use to when I lived in Holly Hill but I do make a run there once in a blue moon. The reasons I like their bbq are many but the main reason I go is because of their hash and rice. I haven’t noticed any negative changes since the new owners took over the business and think that the food and service is still excellent. I do miss seeing Mr. Bub walking outside picking up pecans and eating them when I went there in the past. I also miss joking with Trish and Susan. You’re right. This was our first visit to Sweatman’s. And… for us, it is all about the BBQ, too. I’ve read that Sweatman’s had changed hands and that changes were made that the regulars have grumbled about: particularly that the BBQ wasn’t as good and that the ribs are more strictly controlled. In the end, none of that mattered to us since we didn’t know the old Sweatman’s, but I certainly understand your frustration. Still, I think they serve a good product. Maybe not great, but good. Thanks for your comments. You must have never eaten at Sweatman’s before the place was sold. It is only a mere shadow of its former self in terms of the quality of the BBQ. Side dishes…who wants side dishes? I go there for ONE THING…great BBQ and unfortunately, Sweatman’s is now just run of the mill.